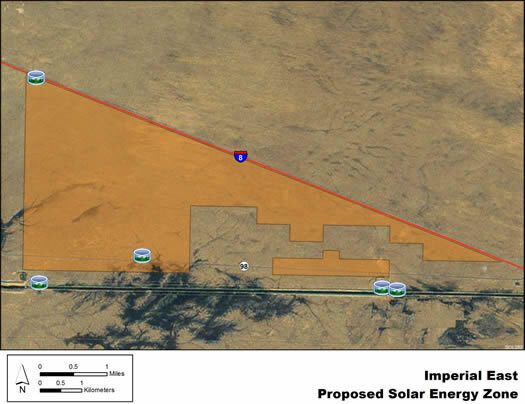 There is one pending solar application within the Imperial East SEZ (Application 49884, for a 4,000 acre power tower facility). The Imperial East SEZ is located in Imperial County in southeastern California, near the United States–Mexico border. The SEZ lies in East Mesa, within the California Desert Conservation Area (CDCA) and the Sonoran Desert. In 2008, the county population was 180,493, while the surrounding two-county region in Imperial County and Yuma County, Arizona had a total population of 387,798. I-8 runs east–west along the northeast edge of the SEZ, while State Route 98, a two-lane highway, passes through the southern edge. The All-American Canal runs parallel to the southern boundary of the SEZ, about 0.3 mi (0.5 km) from the boundary. Two hydropower facilities exist along the canal, along with associated dams and substations. A 115-kV transmission line intersects the southwest corner of the SEZ, and a 500‑kV line is located about 0.4 mi (0.6 km) to the south, running east-west. As of May 2012, one solar project application was pending in the SEZ.